It's funny how things you haven't ever heard of can become important to you in odd ways. 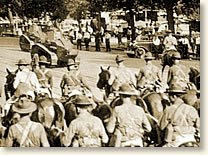 Last night as I was watching Keith Olbermann, he mentioned briefly that yesterday, July 28, was the anniversary of the burning of the tent city of World War I veterans in Washington D.C. by the army (under the command of General George Patton) at the command of Herbert Hoover. I heard him say it, but it didn't fully "click" until later in the evening. We've taken to watching a show on PBS on Monday evenings that's called The History Detectives. Last night they did a whole thing about The Bonus Army. 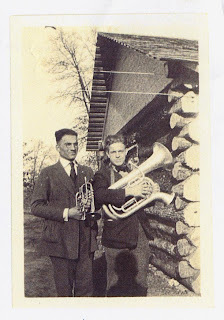 The fellow on the right side of this picture is my grandfather. Suddenly, I'm interested in that bonus those veterans were supposed to be paid. Did it make a major difference in the lives of my grandparents? I had not heard of them before. interesting than when we were younger. Perhaps it is because we are a part of modern history now.